It’s Monday after Thanksgiving and I am exhausted from visiting family and traveling with young children, anyone else? What can make a tired Monday better? Have a cookie, you’ll feel better. And why just any cookie? Let’s go all out and have Christmas cookies! Since my mom makes every cookie under the sun I am always looking for new Christmas cookie recipes. This way, I can enjoy my own cookies and then go to her house and enjoy all different cookies! It’s a win-win situation. 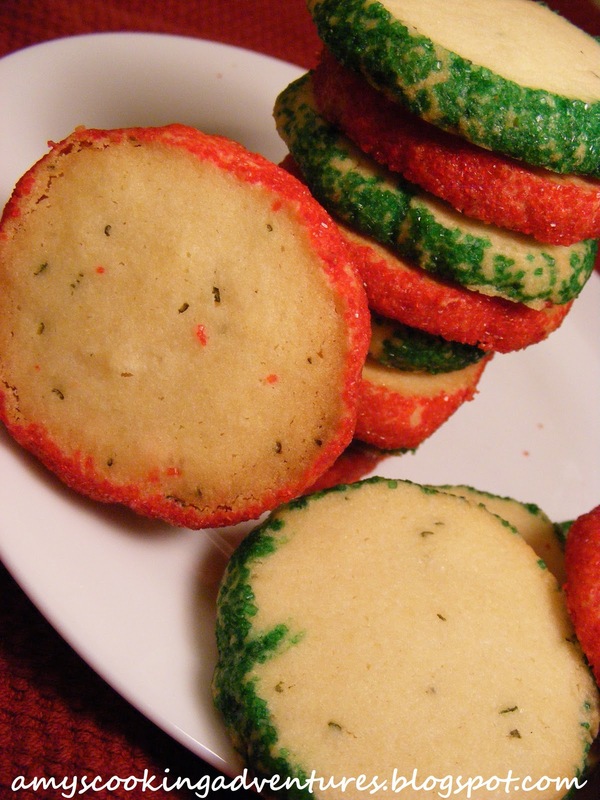 As I was browsing recipes the other day, I came across these Rosemary Butter Cookies on Martha Stewart’s website and thought they’d make a unique kind of Christmas cookie. 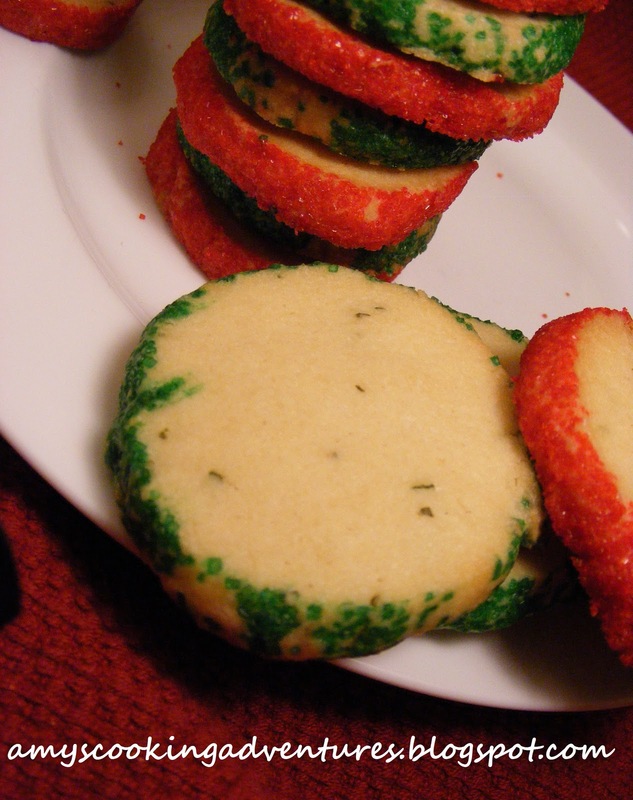 I love that these cookies aren’t super sweet like so many others out there and have an interesting hint of rosemary. I also added a little lemon extract to the recipe because I love the light flavor of lemon mingling with the subtle rosemary taste. I made my cookies a little more festive by rolling them in colored sugar, but you can do white sugar or any color! In an electric mixer, mix butter and granulated sugar on medium speed until pale and fluffy, about 2 minutes. Mix in egg, vanilla, and lemon extract. Reduce speed to low. Add flour, rosemary, and salt. Mix until combined. Place dough on waxed paper. Shape into two logs. On a separate piece of waxed paper, sprinkle a layer of sanding sugar. 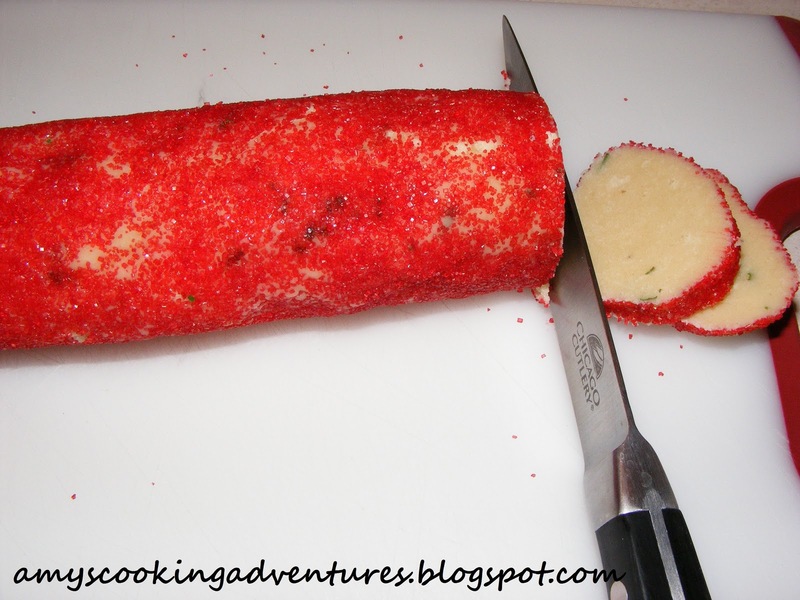 Slowly roll each dough log through the sanding sugar. 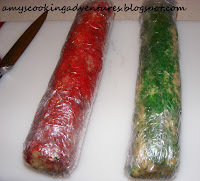 Wrap each log separately in cling wrap. Place in paper towel tubes to hold shape if desired (I didn’t have any tubes and rolled my dough a bit wider). Freeze until firm, about 1 hour. Preheat oven to 375 degrees. Line baking sheets with parchment paper. Cut each log into ¼ inch thick rounds. Space 1 in apart on prepared baking sheets. Bake until edges are golden, 16-18 minutes. Let cool on sheet on wire racks. Store in an airtight container.